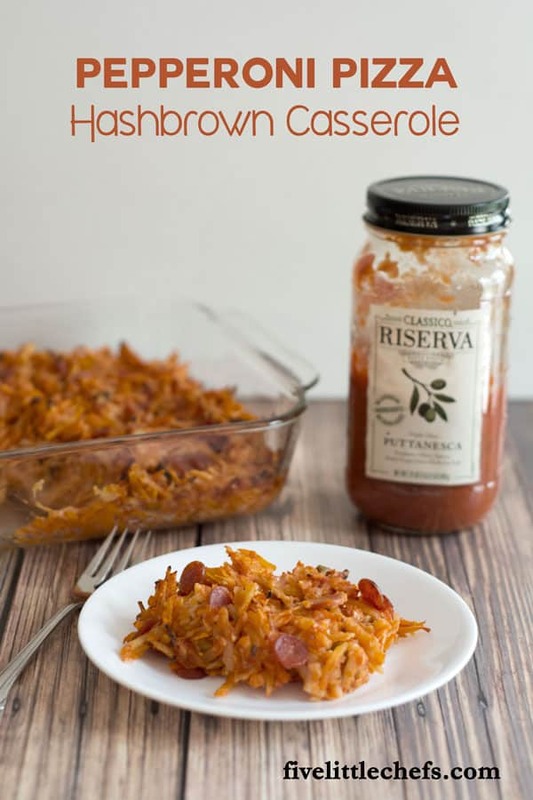 This is a sponsored post written by me on behalf of Classico Riserva for IZEA. All opinions are 100% mine. One of our favorite Sunday side dishes is Hashbrown Cheese Casserole. One of our favorite days of the week is Friday family night when we have pizza and watch a movie. I thought it would be fun to try something new and combine our two favorites. Potatoes are almost like a blank canvas they are so versatile. We love eating potatoes almost every week in different forms such as baked, mashed and as wedges. 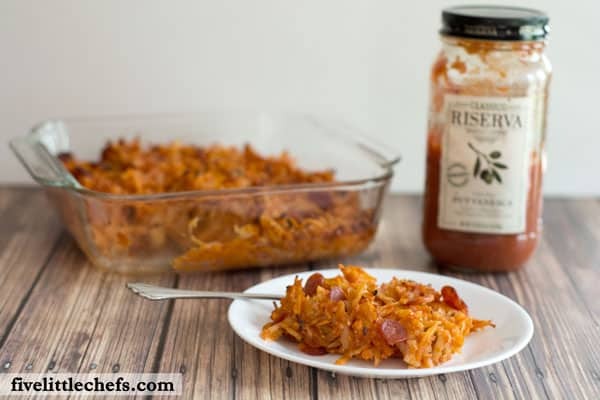 They are a cheap ingredient we always seem to have them in the pantry or freezer in the form of hashbrowns. Another thing we always have on hand is some form of pasta sauce like Classico Riserva because pasta sauce can be used in many different recipes. 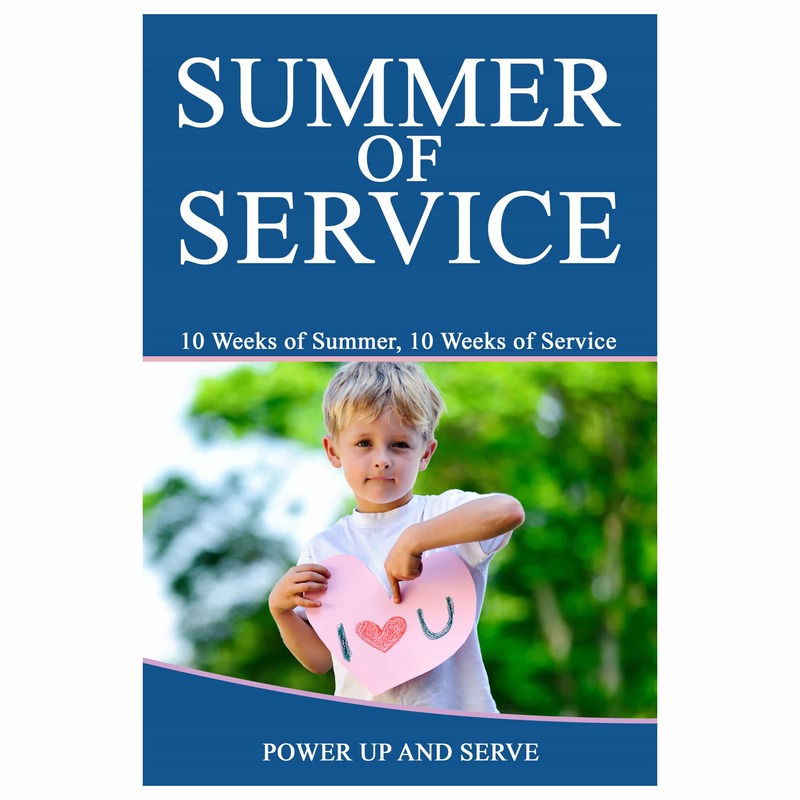 Psst…there is a giveaway at the end of the post so don’t miss it! 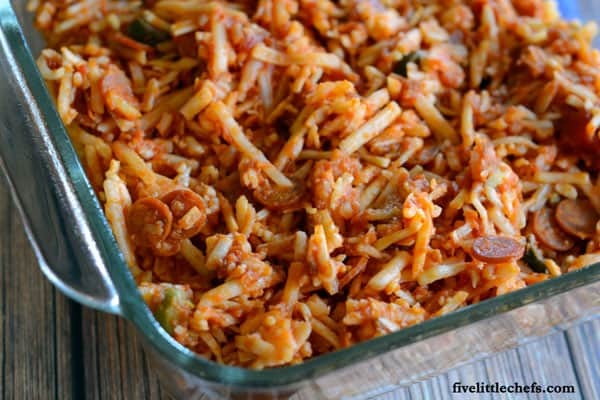 Since this meal is for our Friday night which is all about being together and having fun together so why not get everyone involved in creating this Pepperoni Pizza Hashbrown Casserole. This recipe is so easy even the little ones can help. 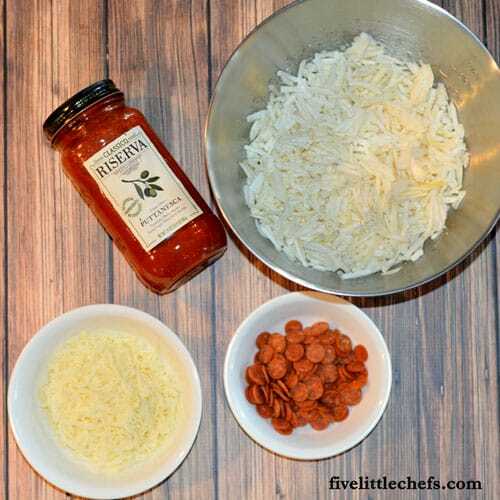 Assign everyone to find one ingredient; frozen hashbrowns, mini pepperoni, mozzerella cheese and Classico Riserva Puttanesca sauce. The moment you open Classico Riserva Puttanesca you “Open Up A Bottle of the Good Stuff.” Instantly you can smell the Vine-Ripened Tomatoes, Olives and Spices. I love that there are no artificial ingredients or added sugar in this elevated sauce. My kids love olives on their pizza. Having olives already in the sauce makes this recipe even easier and faster. Once all the ingredients are gathered and measured they can be combined in one large bowl. My kids love stirring which is why I always use an extra large bowl, after many, many overflowing bowls and a huge mess to clean up. This way no matter how fast or crazy they stir most of the food stays in the bowl. Transfer the mixture into a 9 x 9 pan and bake in a preheated oven for 40 minutes. Classico Riserva is the newest addition to the Classico line of pasta sauces and is available in five varieties including: Marinara, Eggplant & Artichoke, Roasted Garlic, Arrabbiata and Puttanesca. They all sound so delicious. After trying the Puttanesca and tasting the elevated sauce I am definitely going to try each flavor in new and in tried and true recipes. This sauce is so good it will make my current favorite recipes taste even better just from switching out the sauce. I am happy to report that our family night which included Pepperoni Pizza Hashbrown Casserole and a movie was a success. The kids liked the new twist on pizza. It was fast to make and everyone loved helping out. The fun part is that you can add in whatever toppings you love on your pizza into this recipe. Next time we might try adding sausage, bacon or green peppers! Which kind of Classico Riserva Pasta Sauce would you try first? Here comes the fun part! Classico Riserva is allowing me to giveaway 3 VIP coupons. It will be hard for you to choose just one new flavor to try first. To enter all you need to do is leave a comment with what recipe you would like to try with Riserva to elevate your recipes. Leaving the recipe and photo of the dish will make me want to try it too. Contest ends 6/3/16. Preheat oven to 350 degrees F. Spray a 9×13 pan with non stick spray. Bake for 40 minutes or until bubbly and warm. 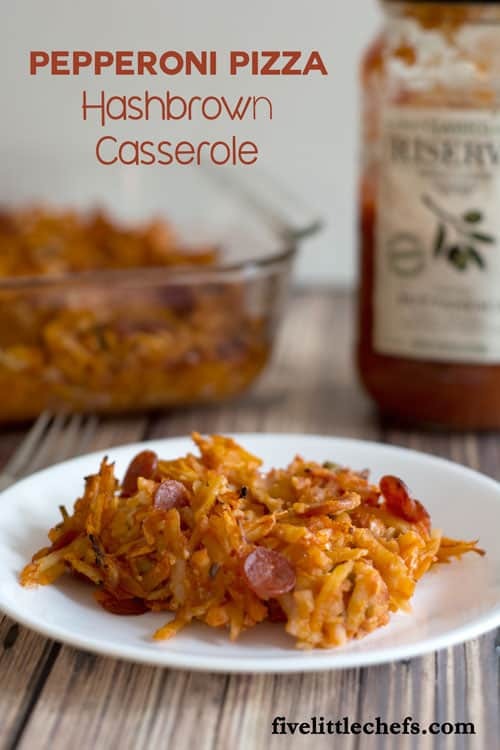 2 Replies to "Pepperoni Pizza Hashbrown Casserole"
We make a ton of casseroles, usually as a way to clear out the cupboards and freezer of things that have been up there too long. You can make them countless ways, and when you throw cheese on top, the kids will not complain about it. We primarily use condensed soups in these casseroles, but these sauces, with the variety of flavors they come in, would be a great substitute. We now have a new recipe to try in place of the traditional casserole. I’m so excited! Thank you for sharing! We have tried a few of the Classico sauces at our house. This one looks and sounds yummy! Can’t wait to try it out.